Another year (2015) is coming to a close. Remember fifteen years ago??? We were told doomsday was around the corner and our computers would crash. The “experts” in Silicon Valley just could not possibility know if our computers could read 2000! What a scam! Remember seven years (2008) ago? Our world was shattered by an economical crash that still has lingering effects. Remember two years ago? Words such as racism, political correctness, and marriage had totally different meanings. For better or for worse, the world is still spinning on it’s axis. What will 2016 bring? Someone asked me that question today. I said, “I do not know but there is one thing I can tell you with certainty. We are in for an unprecedented nasty political season.” It makes me shutter to think of what we are going to have to endure the next eleven months. This evening my mind wandered to a true story about a terrible storm. * The disciples were in a boat on the Sea of Galilee in the wee hours of the morning when a huge storm unleashed its fury on them. 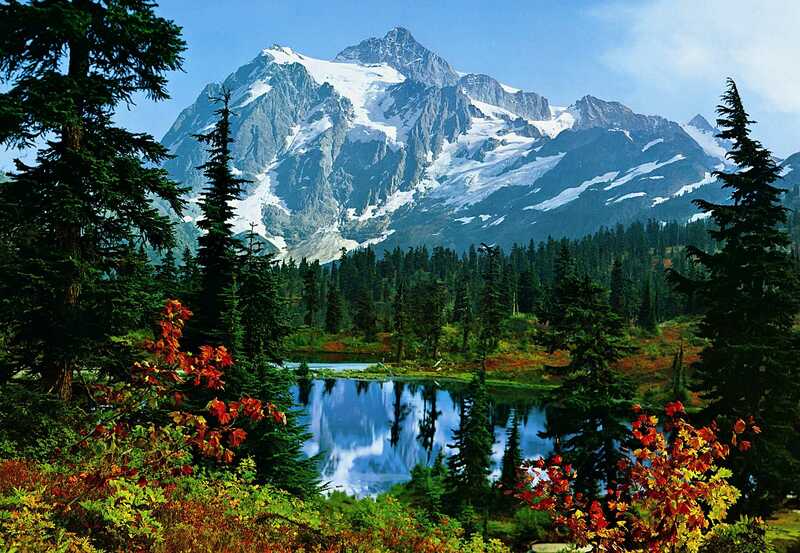 Jesus was not with them as He had gone into the mountains to pray by himself. The disciples were exhausted and afraid as the waves tossed them helplessly in the middle of the sea. Suddenly, they catch a glimpse of a shadowy figure walking on the water. They screamed with fear and gasped in terror, “It’s a ghost!” What else could it be? No human walks on water in the middle of the sea. Jesus speaks to them above the roar of the storm and says, “Be of good cheer (be happy). It is I; do not be afraid.” Peter stammers out, “Lord, if it is (really) You, command me to come to You on the water.” And Jesus responds, “Come” (Come on Peter. Come to me). Without hesitation, Peter swings his legs over the edge of the rocking boat and takes a few steps on the rolling sea. Suddenly a lightning bolt slices through the blinding rain and Peter sees the monstrous wave rolling over the turbulent sea towards him. Thunder crashes. Peter instantly is intensely aware of the storm and sees his impending doom. As he sank into the sea he cries out, “Lord save me.” Jesus instantly reaches out and firmly grasps Peter’s outstretched hands. Together they walk through the storm back to the boat. Peter is now walking with confidence. And then, there is peace. Dead quiet, instant stillness. The calming, serene, divine presence of Jesus brought them to their knees in worship. Where will my eyes focus? Our pastor has reminded us several times lately. “As Christians, we know how the story will end. We do not need to fear.” In other words, in the midst of troubling, uncertain and even destructive times, our security, our hope, our faith, our trust is in Jesus. Jesus has told us with his own words that this world will one day come to an end. But before it does, there will be a terrible time (storm) of war, pestilence, earthquakes, lawlessness, corruption, evil and persecution of Christians. But in the end, He (Jesus) will return and take all believers, all who keep their eyes focused on Him, to that grand and glorious place He has prepared for us-heaven (Matthew 24). Some of the last words of Revelation 22 are an invitation to “come”. I have a choice. Which will I choose? Do I focus on the storm and coward in fear? Or, do I trust Him and reach for His outstretched hand? ….the lightning bolts are striking close and the thunder is booming. The boat is rocking perilously, threatening to capsize. Do you see a “ghost” on the water? It is really the Master coming to calm your fear. Don’t take your eyes off of Him. I love the song “God On the Mountain”. In several hours the ball will drop in Times Square and bells will chime as we welcome 2016. It will be a new year with the inherited problems of today. There are many things about the future I do not understand, but, I know who holds my hand. * Three of the gospels record this story: Matthew 14: 22-33, Mark 6:45-52 and John 15:21. The last several days it has been very noisy on the farm. 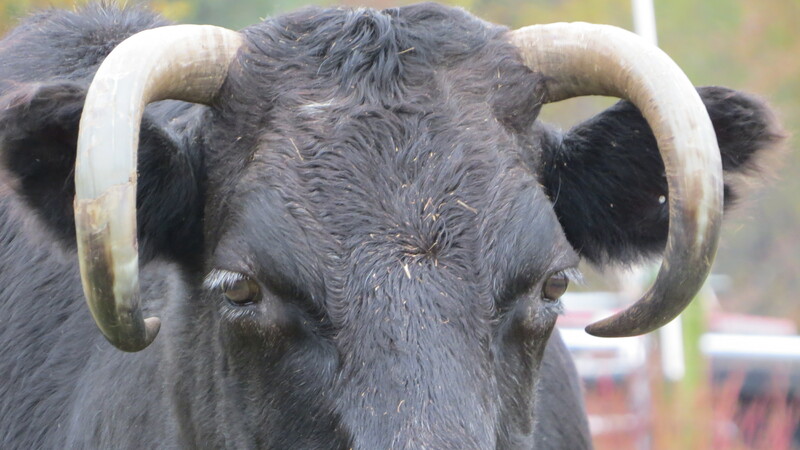 It is weaning time and with 95 calves wanting a drink from mama and 95 mama’s missing their babies as their udders are full of milk, there has been a lot of noise. But the time comes and it has to happen. It is part of the life cycle of critter and human babies. The security of baby stage must give way to more independence. Those of us who have children can remember the wails at bedtime when the pacifier was “mysteriously” lost or mom had determined that the bottle was no longer necessary. Fortunately that trying stage doesn’t last more than a few days. 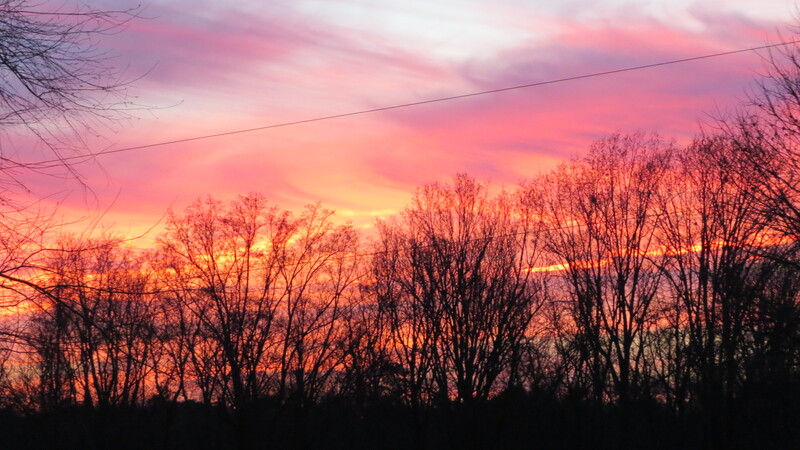 Tonight on the farm it is finally quiet. The calves have adjusted to their all-you-can eat buffet of Purina Precon Starter Complete and hay and the mamas are chowing down on chopped hay at the feed bunk. Sometimes it feels like we work 8 months of the year for the 4 months of winter. 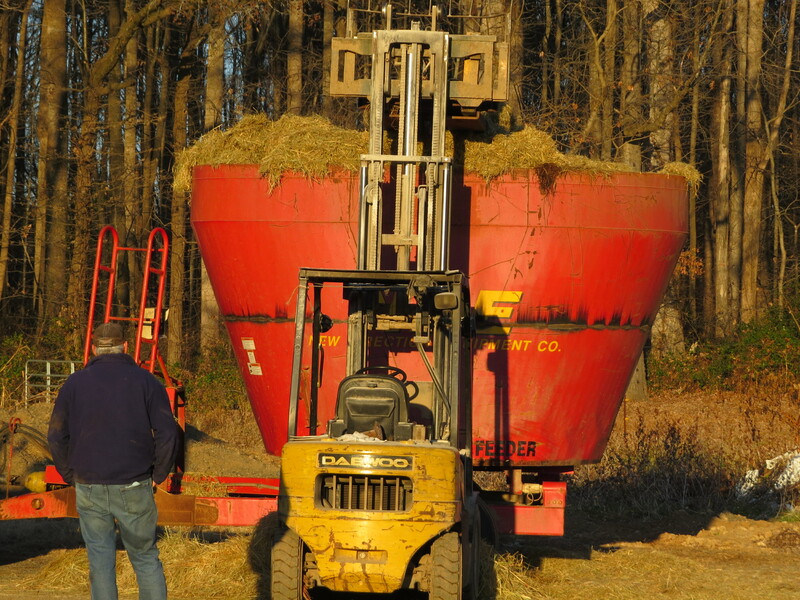 Starting in May, we gear up for hay season and that goes through most of the summer and into early fall. Gene needs 1200 plus round bales of hay to carry him through the winter. 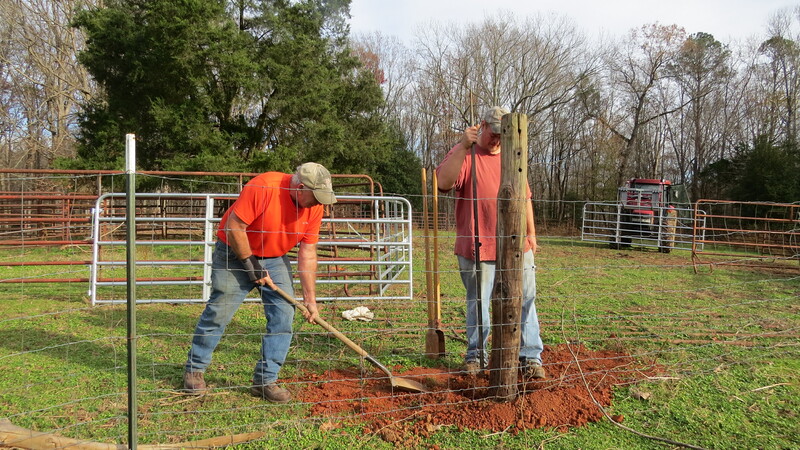 Then there are fences to repair, cows to sort, and the list goes on and on. 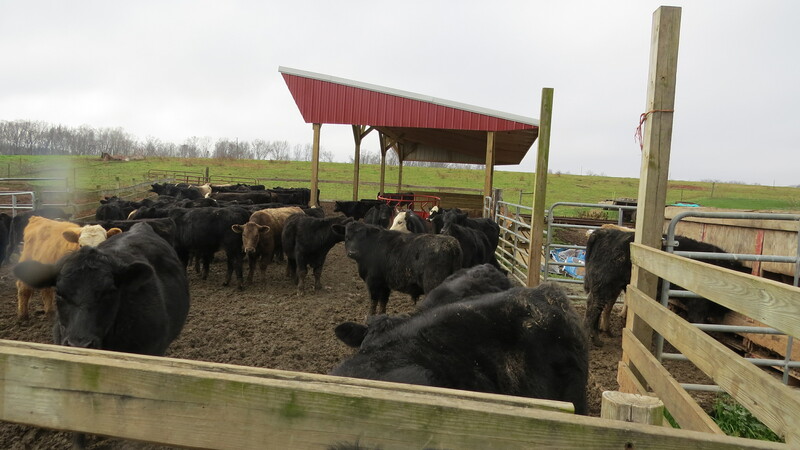 For several years Gene has been researching and figuring out how to better utilize his hay and care for his herd of Angus cows. He has been working at this in phases and this year it really came together for him. 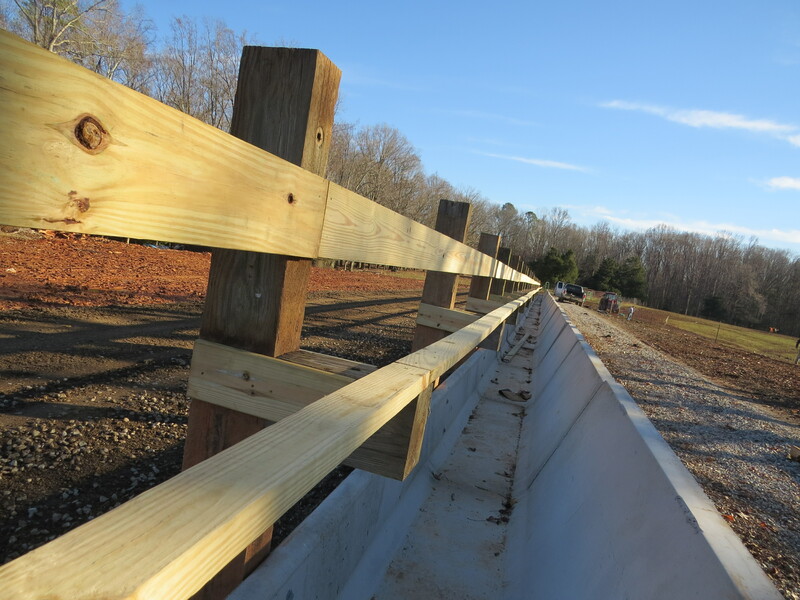 Phase 1: Last year he purchased a vertical round bale mixer wagon (see blog links at the end of post) and put in a 300 ft. concrete feed bunk. 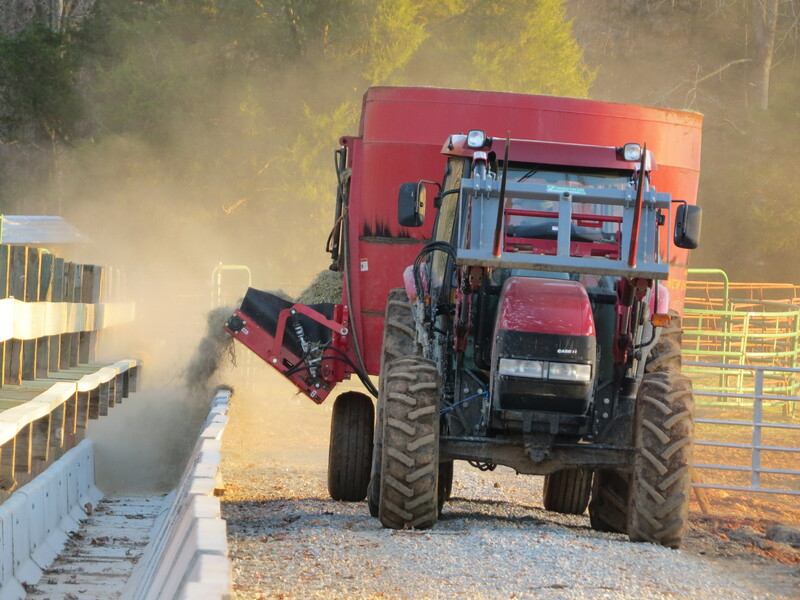 The mixer wagon grinds up the round bales of hay. 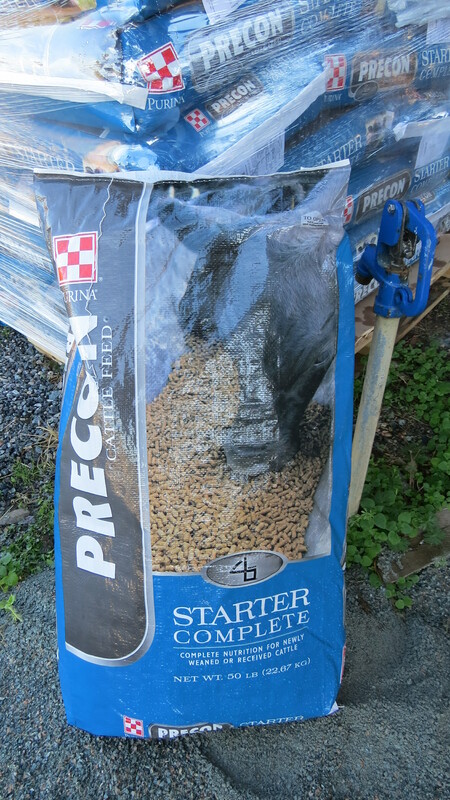 He can add corn, molasses or other feed commodities such as brewers grain to the mix. Because all the bale, the bleached out brown on the outside along with the green inside, is ground together, there is very little waste. 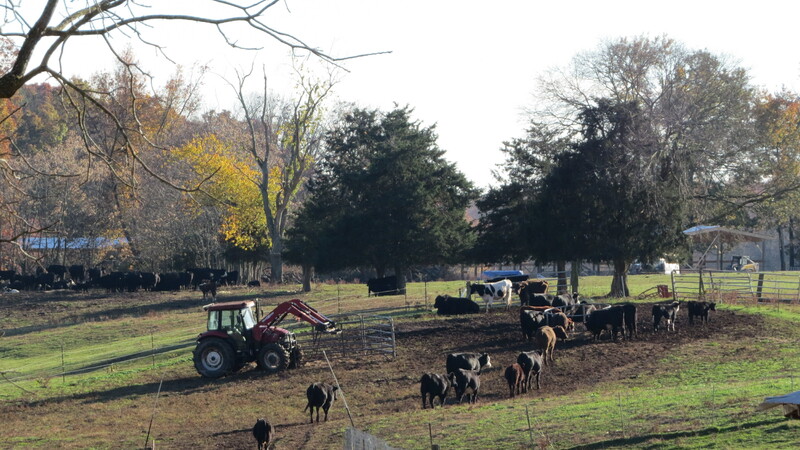 The cows chow down and eat it all. 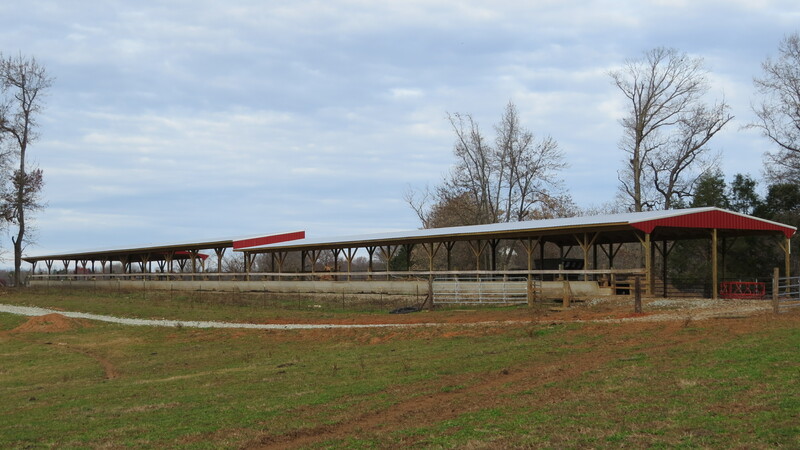 Phase 2: This fall he put a 304′ roof over the feed bunk with wings on each end for a hay ring, maternity/catch pen, and hay & creep feeder for young calves. He also got a bale unroller. 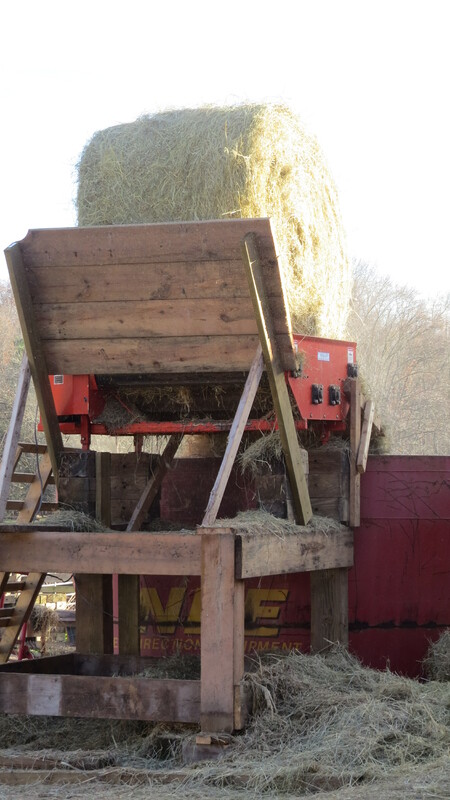 This unrolls the bale of hay into the mixer wagon which greatly speeds up the grinding process. 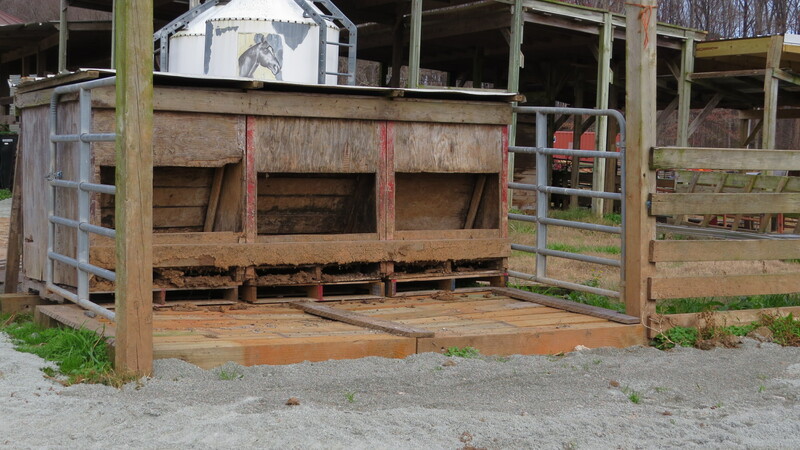 He cleaned up his mixing area, and built 2 shed roofs over feeding areas where the cows did not have any protection from the weather. 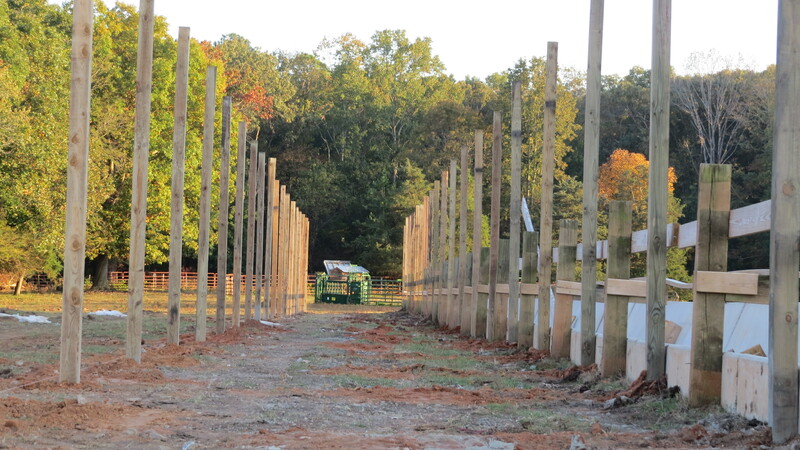 All of this means more gates to hang, fences to repair and extend, gravel to put down and grading to be done. 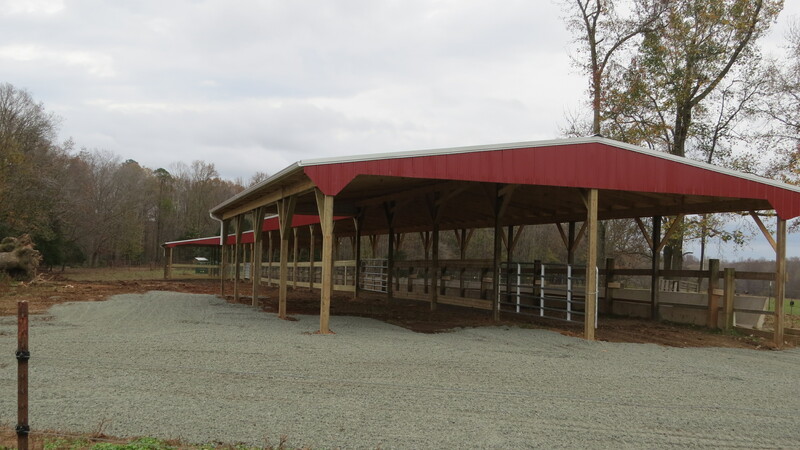 The roof is 304 ft. long and 20′ wide over the feeding area! 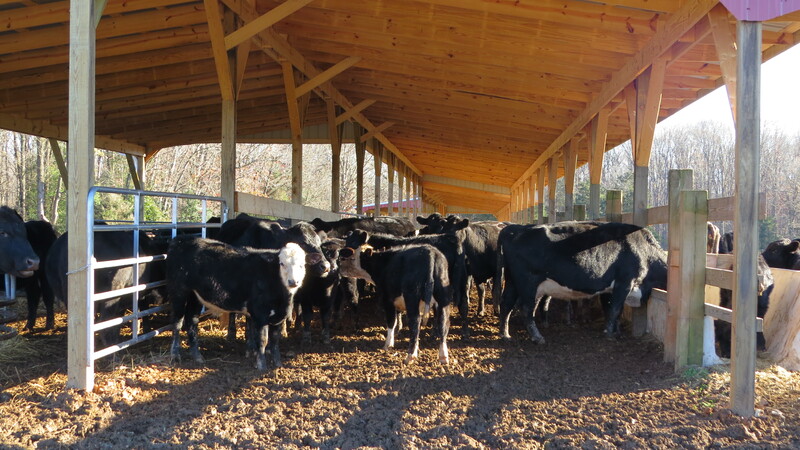 At each end of the barn is a 40’X64′ A-roof section for a catch pen, creep feeder for calves, round bale feeders, and covered loafing area. Because of the sloop of the ground, he had to put a step-down in the roof to help the height from getting to tall. I like this picture. 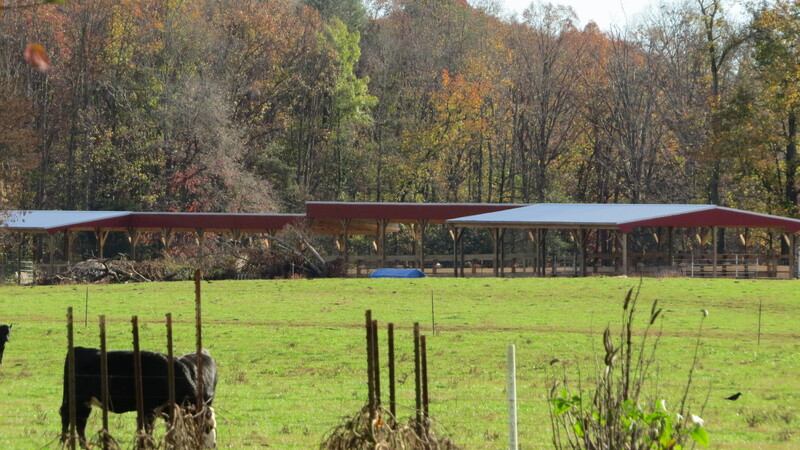 It is taken from a distance and shows both ends of the barn. It looks so long! 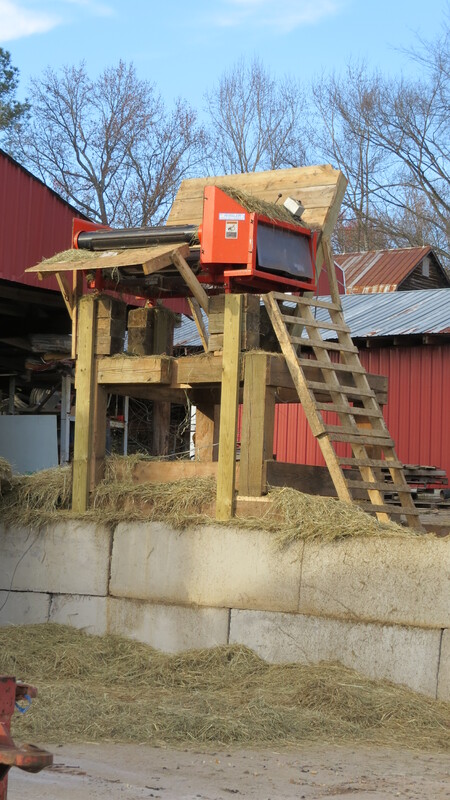 Creep feeder for the calves and their own personal round bale of hay. Round bale for the cows. 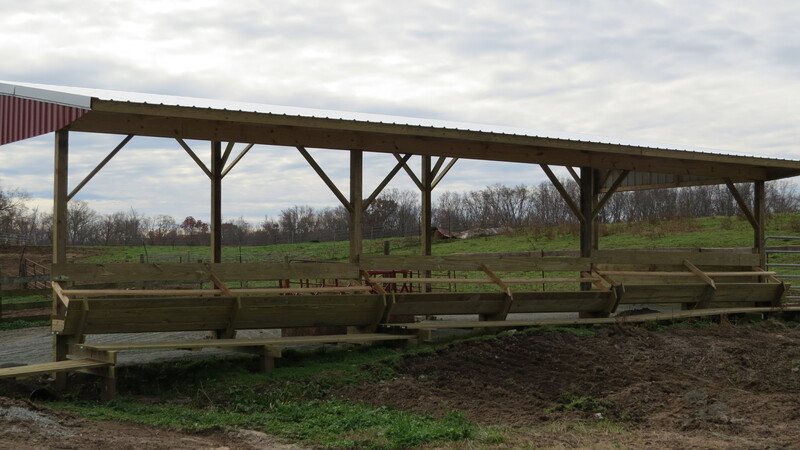 This is a platform he built for the bale unroller. 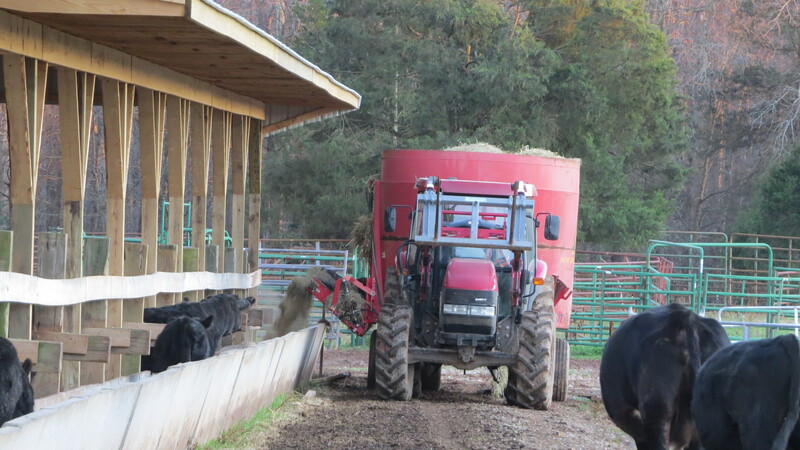 It helps his mixing process go a lot faster versus dropping the whole bale in to be ground up. This is another area he cleaned up. On the left is where he fills the mixer wagon. 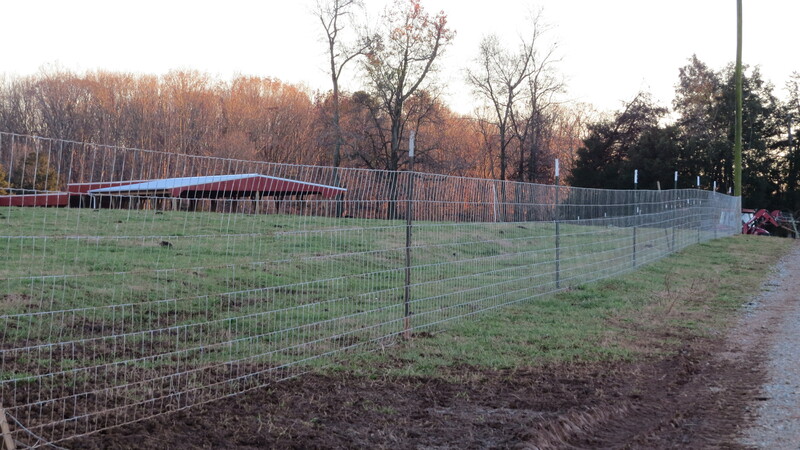 The area on the right is a holding area for turkey litter before it is spread on the fields. 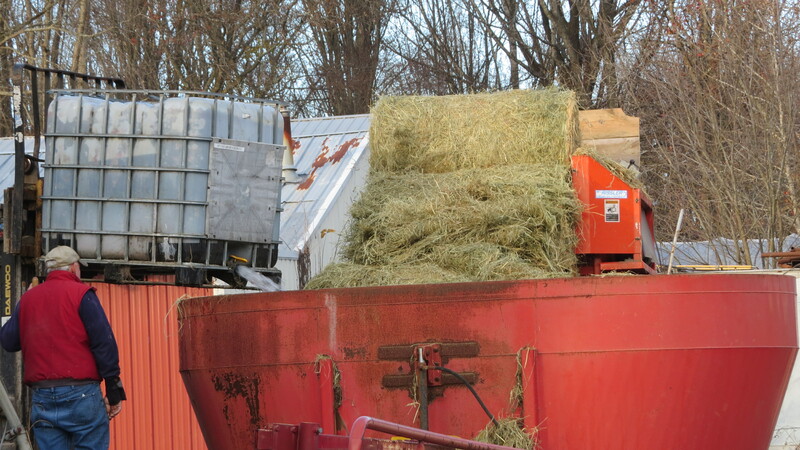 Putting water and molasses onto the hay mixture. The herd hanging out in the barn waiting to be fed. 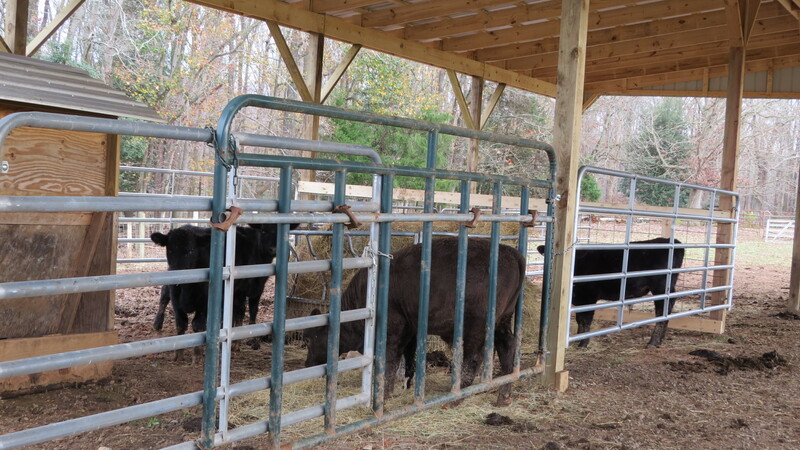 This is the weaning area for young calves at 450 plus lbs. They are fed Purina Precon Starter 30-60 days before they are sold. For 2 days it is very noisy as the calves adjust to being independent of mama. 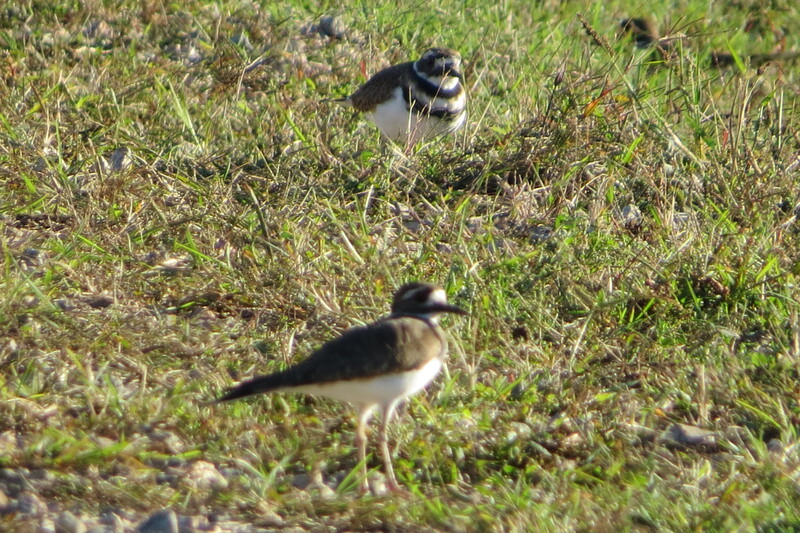 The warmth of the December sun beckoned me outdoors this afternoon for a ride on my golf cart. I wanted some holly and cedar branches for my Christmas decorations and I knew just the spot on the farm to go looking. 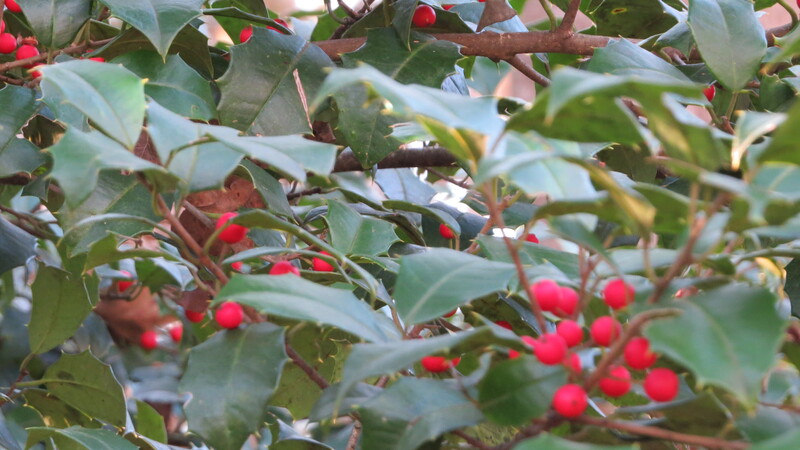 Only the female Holly trees produce fruit and they are loaded with bright red berries. 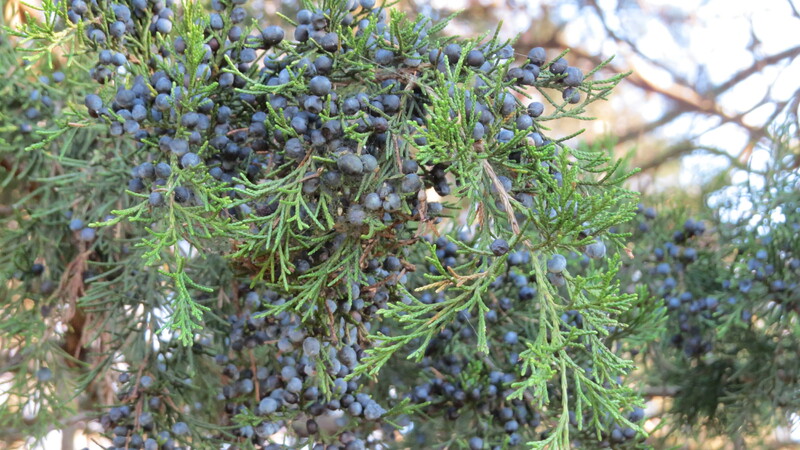 The boughs of the female Eastern Red Cedar trees were hanging heavy with dark blue berries. I had forgotten that they also produce berries. These are technically juniper trees. 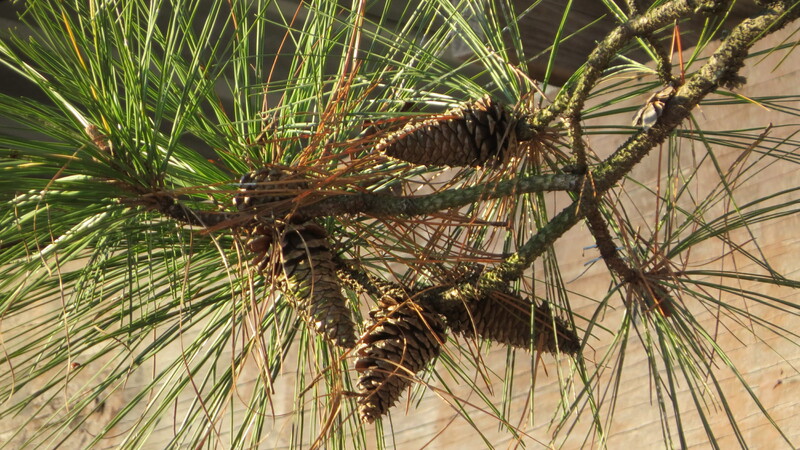 The male trees have small tan colored pine cones. 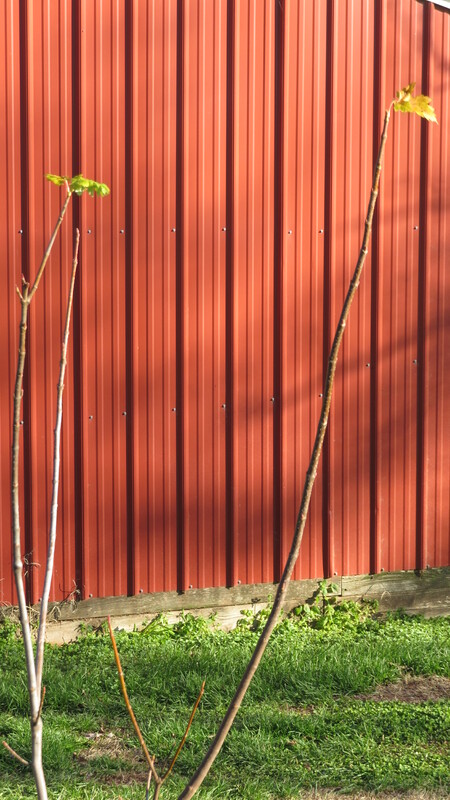 Click on this link for a very interesting read on these trees. 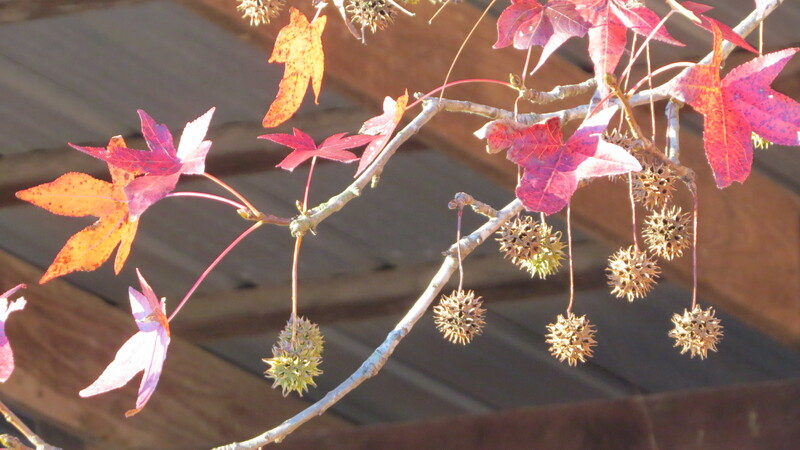 As I was nipping branches to bring home, I suddenly became aware of the “little things” in the woods. 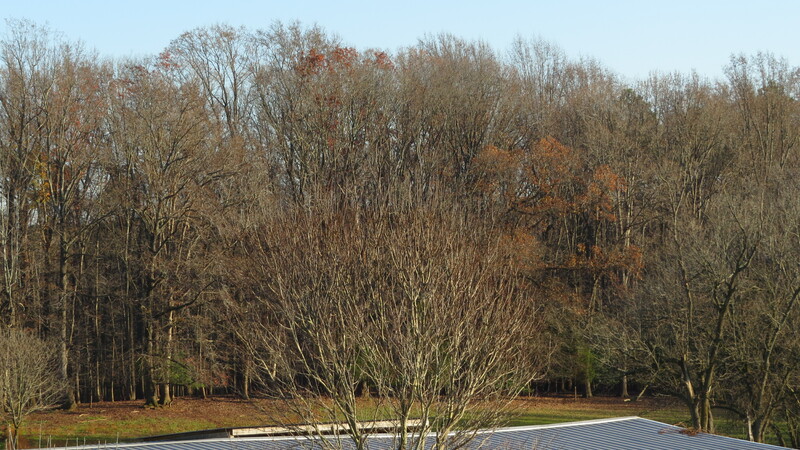 It is December but it was a beautiful, warm, sunny, peaceful day. 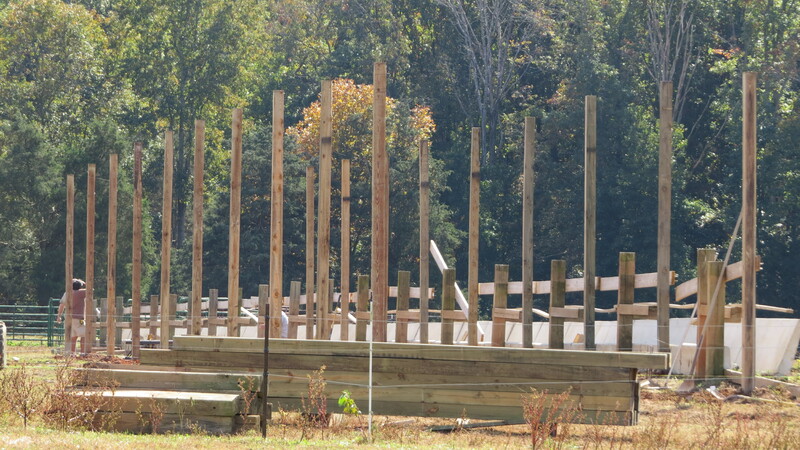 I heard them first and then saw two squirrels scampering over a log laying on the ground in the woods. I watched as they frolicked in the leaves and chased each other over the log, up a tree and down again. I continued to notice “little things”. A small tree with one little leaf left at the top of it’s two tallest branches. 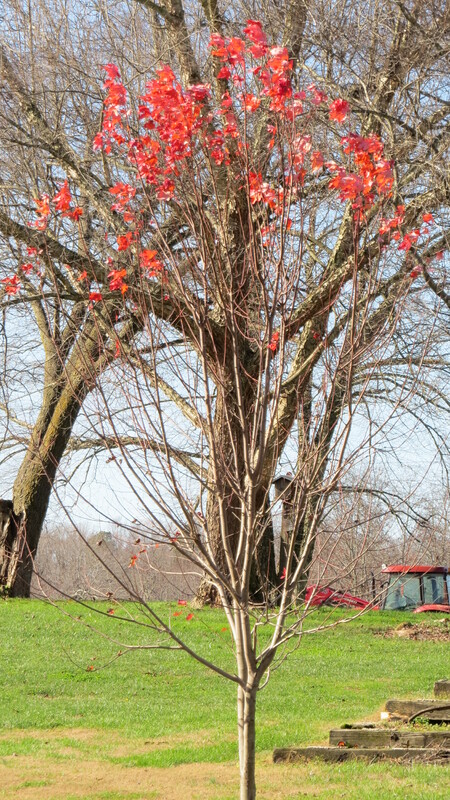 Another tree with brilliant red leaves at the top like a tuff of hair on a bald head. The beauty of nasty gum balls. 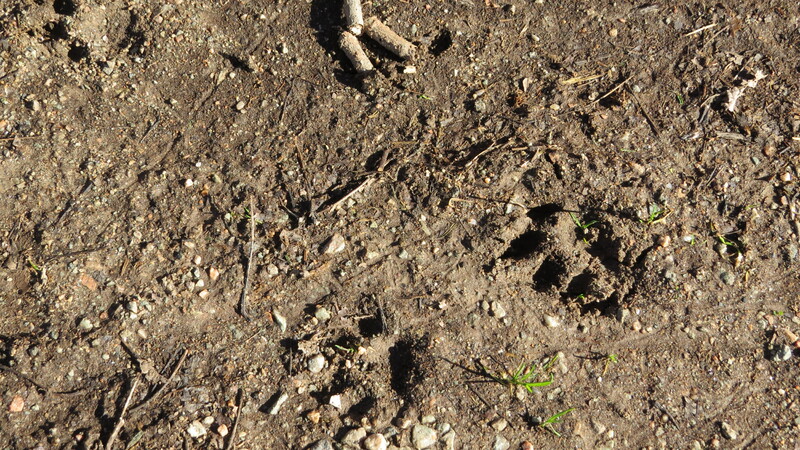 There were 3 sets of paw prints in the soft dirt. 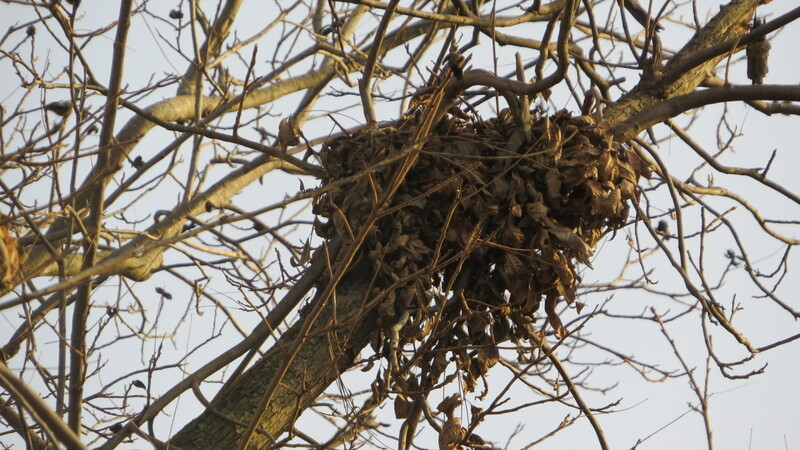 A squirrel’s nest high in the pecan tree. He certainly built where his food source was! 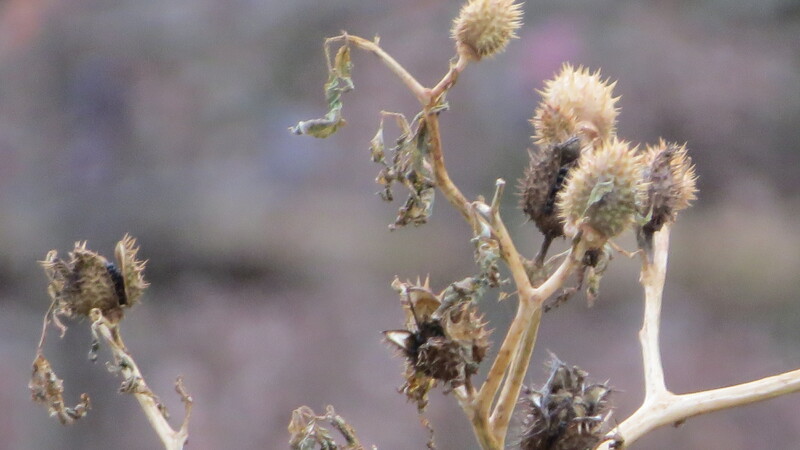 Depending on the day and time, the big picture can be drab, barren, discouraging……. 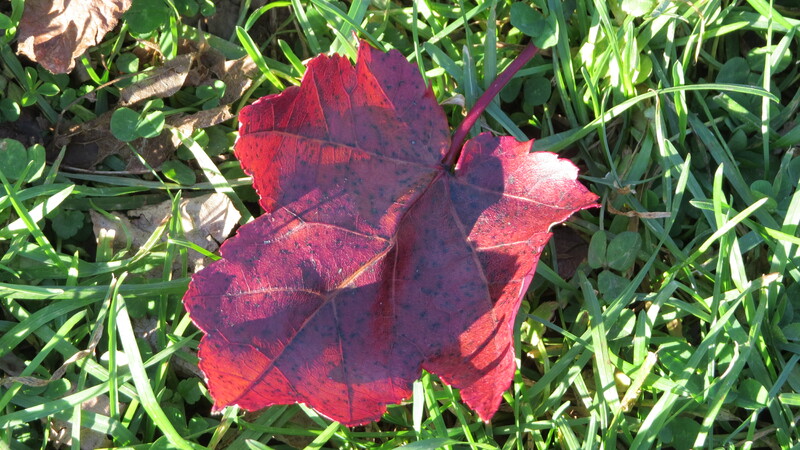 When we look at just the big picture, we miss the simple beauty of the “little things”. If we focus only on the “little things” we miss the scoop of the big picture.